Check out our event info on Facebook. Comments Off on Are you on Facebook? We are! Thank you Homer Smith Insurance! Thanks again to Homer Smith Insurance for once more being a Premium Sponsor of our 2016 concert season! We really appreciate your support! Comments Off on Thank you Homer Smith Insurance! Those on our paper mailing list will be receiving their printed copy shortly, and those on our electronic email list will be receiving a link to this page. Here is an earlybird preview of our 2015 Annual Report! What a wonderful year it has been – please read all about it! Click each image to view that page. Move through the pages with the left and right arrows, or click the X to return to this page. March 2015: New Annual Report / Newsletter Publication! Click any page to view a larger version. Comments Off on March 2015: New Annual Report / Newsletter Publication! 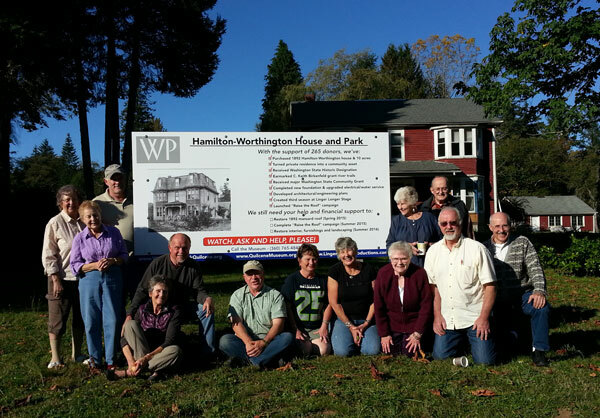 The Worthington Park coordinating committee is excited and ready to complete Phase II of the project – restoring the exterior of the house which includes replacing the failed house foundation (completed) and rebuilding the mansard roof and third floor of the residence. The necessary engineering and permitting is in progress and work is scheduled to begin in late spring when the weather cooperates. You will be hearing more about the project in the 2015 spring newsletter. Museum walls are bursting out with new donations and the buildings and grounds continue to be a destination for people. There was a 182% increase from 2013 (?) in attendance – 2,724 visitors to the Museum and events in 2014. Tourists came from 68 Washington cities, 18 U.S. states and 6 foreign countries. More than one hundred items (artifacts, documents, photos) were donated by 24 individuals. They included: games, insulators, books, 1889 Quilcene Plat Map, 100 year old Brinnon post office desk, 100 year old bamboo hall tree, publications, menus, Buck Mountain Logging decals, Quilcene Hotel linen, clothing, QHS memorabilia, kitchen items, furniture, artwork, tools and many other local items. Twenty docents volunteered over 400 hours to meet and greet visitors during the season. New exhibits included the Worthington Library Books and electrical pole insulators. Planned exhibits for the 2015 season include: Coyle Peninsula and Miles de Leon Art Work and Biography. It was a record year for events – 28th Museum season, QHS Alumni Reunion reception, annual wine tasting, Linger Longer concerts, wedding and receptions, autumn cider pressing, and Quilcene Oyster Half-Marathon, 10K and 5K races. Quilcene Historical Museum is approved for the Washington State and National Historic Registries! 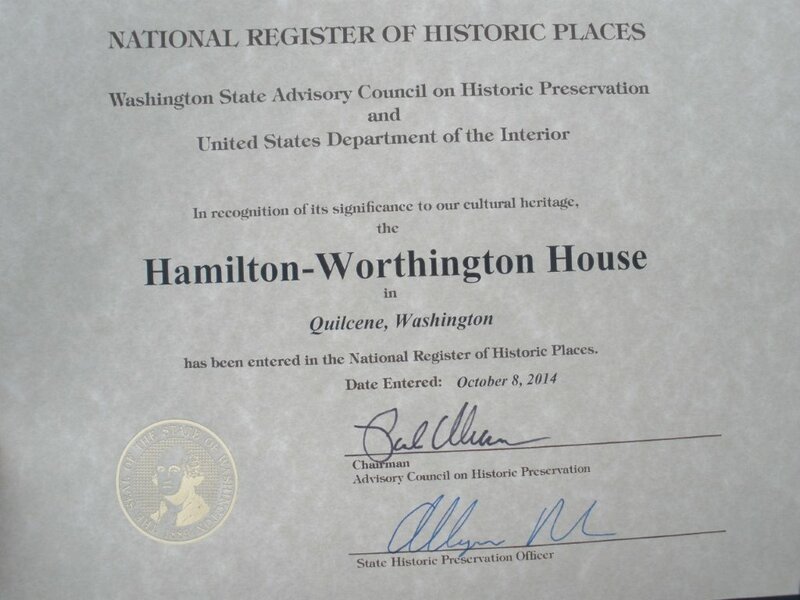 After a long process, the Museum was awarded placement on the Washington State Heritage Registry of Historic Places on February 20, 2014, for the Hamilton-Worthington House. This honor is based on the cultural/historical significant of M.F. Hamilton and W.J. Worthington and their families for their contributions to the social, economic, and cultural development of early Quilcene beginning in the 1880’s. It also recognizes the architectural significance of the mansard roof 2nd Empire Victorian house built by Hamilton in 1892, and purchased and lived in by the Worthington family from 1907 to 2013. This registry is granted and maintained by the governor’s Advisory Council on Historic Preservation and the Washington State Department of Archaeology and Historic Preservation. On October 8, 2014, the house was awarded placement on the National Register of Historic Places. This honor was given by the U.S. States Department of the Interior, in recognition of its significance to our cultural history. Comments Off on WA State and National Historic Registries!